Home » Our Doctors » Paul Naftali, O.D. Dr. Naftali is a graduate of Duke University. He completed his professional training at the University of California at Berkeley in 1989 graduating 2nd in his class. He performed an optional additional year of residency at a unique combined program between the Pennsylvania College of Optometry (now Salus University) and Hahnemann University Hospital Department of Ophthalmology in Philadelphia from 1989-90. 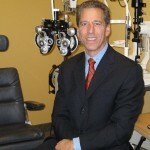 He is board certified and a Diplomate, American Board of Optometry. Dr. Naftali has more than 20 years of practice; he has developed strong interests in the treatment of glaucoma and macular degeneration due to his own family history. In 2012 he was board certified by the American Board of Optometry.